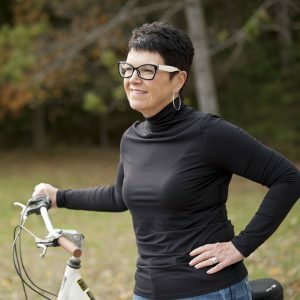 Connected to health and fitness at a provincial and national level, in February 2008, Kim was accepted as a Provincial Council Member (Ontario) for the Fitness Industry Canada. Within the York Region business community, Kim has also established a strong reputation for her distinctive style, personalized services and business spirit. In April 2008, Kim was selected to become a Community Ambassador for the lululemon athletica©. Kim is the Co-Chair of the Mt. Albert Sports Day 5km Run/Walk (2016-2018 races). Kim served as President of the York Region Business Women’s Association in 2005 and as Past President in 2006. Kim also served as the Chair of the Leapfrog Business Networking Group in 2009. She is also a valued member of Ontario Society of Health and Fitness, Fitness Industry Canada and the Canadian Association of Sports Sciences and is locally registered with the East Gwillimbury Chamber of Commerce and Mount Albert Village Association. Over the years, Kim has been nominated and recognized numerous times for her entrepreneurial successes and business savvy including Entrepreneur of the Year – 2008 & 2016, Small Business of the Year – 2009, Large Business of the Year – 2010 and most recently she was the recipient of the 2018 Women in Business Award. At home, Kim is an active mother and grandmother. Kim enjoys many activities including walking, water skiing, downhill skiing, cooking and hiking.